Drones can be so much fun to use, but drone users also need to be responsible. If you're just starting to learn how to fly your new drone, it's important to understand some common drone mistakes. It's easy to make mistakes when first learning how to fly, so let's take a look at a few mistakes you should try to avoid. Before you go out to fly your drone, it's important to understand the weather conditions. Mother nature has her own agenda and weather can rapidly change. It's important to stop flying if it's too windy or raining. Additionally, you want to ensure you have plenty of open space to fly. Unfortunately, not everybody has a huge backyard for drone flying. However, parks and fields make some of the best places to fly your drone. It's important to always remain aware of your surroundings and any other people around you. While it may seem like you can get away with breaking the rules when flying your drone, law enforcement is quick to remind drone users of the laws. The FAA has several guidelines that should always be followed. Before flying for the first time, it's important that you understand all of these rules. If you don't follow the rules, you can end up getting in trouble, damaging property, or even hurting someone in the process. If you want to lose your drone as quickly as possible, this is a great way to do it! The further away your drone is from you, the harder it is to remain in control. If your drone gets turned around, you can easily lose orientation and have a drone disaster on your hands. Until you have plenty of practice under your belt, it's a good idea to keep your drone close. 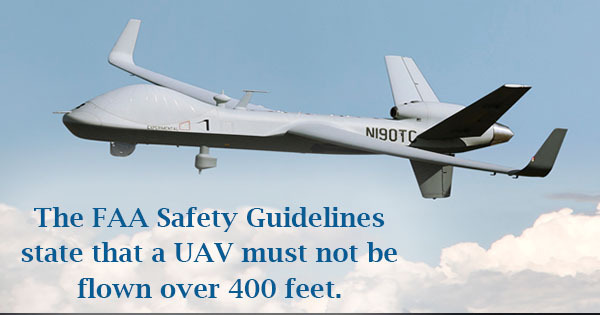 Additionally, the FAA Safety Guidelines state that a UAV must not be flown over 400 feet. As a beginner, you're going to make mistakes. Luckily, there are drone repair shops that can help fix your drone if an accident happens. But hopefully you're now a little more aware of some common drone mistakes and you'll be able to avoid them while learning to successfully fly your drone.